Looking for a vehicle that does it all... And we mean literally! This Ford Edge is fully loaded to the nines and comes with a towing package that provides up to 3,500 lbs of towing! 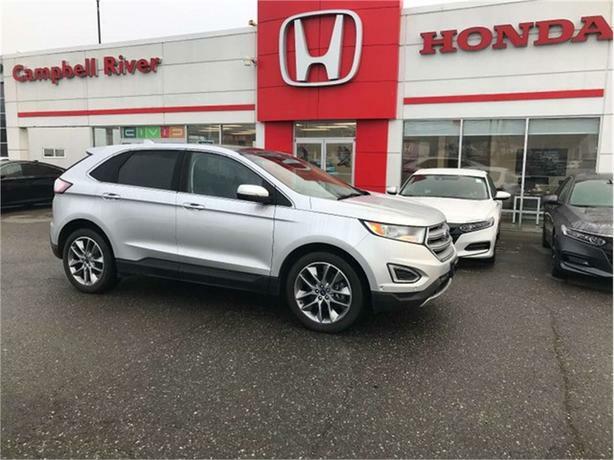 This vehicle is loaded with all the great features you can expect, and with an added bonus of parallel park assist and lane keep assist that will help on many road trips! Back seats fold flat for much more cargo space than you'd imagine! And never get lost again with a built in navigation system, and jam out to your favourite stations with Sirius XM capabilities. This fully loaded vehicle comes with leather interior, tow package, heated/ventilated seating, cargo tray, all-wheel drive, panoramic moon roof, navigation to get you where you need to go!